The Accelerator Network is Startup Partner at Media Playground, the industry leading annual conference organised by Mediatel where media meets technology, with a strong focus on consumer trends or commercial opportunities. 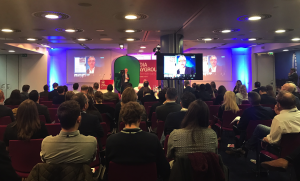 The conferences always provide a lively day of panel discussions, presentations and debates, highlighting current innovations, insights, ideas and challenges facing anyone involved in digital media. As Mediatel’s Startup partner The Accelerator Network we have a stand in the event space and each year invite relevant startups from our Network to present their companies to a highly-selected audience of Media industry professionals. It is always an extremely positive experience for The Accelerator Network and our startups (who have the opportunity to meet buyers, partners, collaborators, clients..) and we are looking forward to next Media Playground event! 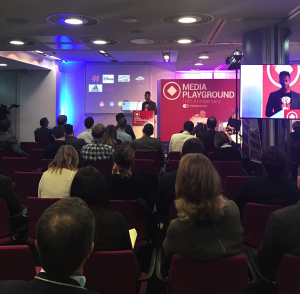 Here below you can find an overview of the startups we have presented at Media Playground to date. Whichit – Interactive content platform that enables publishers and marketers to increase user engagement, open new revenue streams and gain user-related insight. ContentCalendr – It helps teams maximise social media return by streamlining all workflows into one platform. Adavow – It reduces the number of ‘wasted’ ads generated by retargeting to consumers who have already converted. Audludio – It’s the world’s leading Sensory Advertising Platform: mobile advertising that uses touch and haptic sensory feedback technologies to create ads proven to be 10x more memorable. 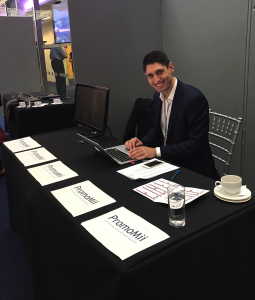 PromoMii – It increases Television Broadcasters’ exposure of TV shows by automatically and cost-efficiently collecting their ads & trailers and distributing them to the right digital channels. FanBytes – It makes brands go viral through mobile video on Youtube & Snapchat. TouchCast – Video platform built to make communications richer, interactive and more human.